You know that Cute W loves games. We have a ton of games at our house, and our supply often outpaces our ability or inclination to play all of them. When I find a game we really like, I tell you about it. 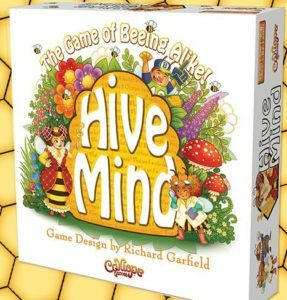 Here’s the latest favorite: Hive Mind. Cute W actually acquired this game as a perk for contributing to a Kickstarter campaign that benefited Calliope Games. This is a social game which can include up to 12 players, and it’s very simple to play. So simple, in fact, that you almost wonder how someone didn’t come up with it already. Basically, you take turns asking a question (questions are provided for you, or you can make up your own), and then everyone writes down the answer to the questions. Your goal is to get the same answers as everyone else to show that you, a bee in a crowded hive, is like-minded with your hive community and should stay. If your answers are different, you’ll eventually get kicked out of the hive. So a question might be “Can you name three kinds of Christmas trees?” and theoretically, answers might be balsam fir, pine, frasier fir, spruce, fake, tinsel, Charlie Brown, or that big one at Rockefeller Center. . . depending on participants’ personalities or general competence or whatever. So, first, this is quick to get started, and it can work for all ages as long as participants know how to write. It’s also a nice little bonding activity, because as players read out their answers, when players have the same answers it helps them both, so you can feel a little camaraderie even if you’re playing “against” each other. Anyway, it’s a fun one, and I recommend it. Like I said, we go through far more games than I actually talk about, so we have quite a supply. We recently de-cluttered and passed some of our gently-used games along to The Giving Tree. This mom in Scotia offers up Christmas gifts and everyday necessities to folks in need in memory of her daughter who passed away. You can like their Facebook page to get updates on items that she needs.